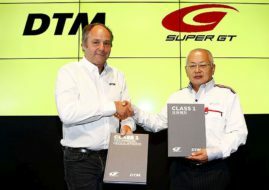 The new season of the Japanese GT championship, the 25th season since the JGTC inauguration and the 14th season under the name Super GT Series, will start this weekend at Okayama International Circuit. Fifteen squads in GT500 machinery and twenty-nine crews in GT300 class are ready to fight for two championship titles which would be defended by Ryo Hirakawa/Nick Cassidy in the #1 Lexus LC500 and Nobuteru Taniguchi/Tatsuya Kataoka in the #0 Mercedes-AMG GT3. Last year’s season opener at Okayama was won by Hirakawa/Cassidy in Lexus Team KeePer Tom’s LC500, what was a big step on their way to the championship title. In a fact, Okayama’s race was an absolute triumph for Lexus with six LC500s in the first six positions. This year, Lexus will have again six cars on the GT500 grid, fighting against five Honda NSX-GT cars and four Nissan GT-R machines. In GT300 class, the most used car would be a Mercedes-AMG GT3 with four ‘silver stars’ on the grid. Toyota will be represented with five cars in total but with three different models. There would also be a pair of Porsches and Audis while Japanese brands would be represented with two RC F GT3, two Nissan GT-R Nismo GT3, two Honda NSX GT3 and one Subaru BRZ. It would be the first season in a domestic championship for Honda NSX GT3. When looking the faces on the grid, definitely the biggest star in 2018 would be former Formula 1 champion and Super GT rookie Jenson Button. The 38-year-old Briton recorded one Super GT start last year, driving for Team Mugen at Suzuka 1000, but this would be his first full season and he could be considered as a rookie. Button will share Team Kunimitsu’s #100 Raybrig Honda NSX-GT with Naoki Yamamoto. It’s hard to say who will be their main rivals because all three manufacturers have several crews which represent a combination of experience and speed capable to fight for the title. At the official test which took place at Okayama in March, the fastest car was the #6 Wako’s Lexus LC500 of Kazuya Oshima and Felix Rosenqvist. The 26-year-old Swedish driver, a regular contestant in Formula E, is also a rookie in Super GT Series after spending the previous season in the Japanese Super Formula. Besides defending champions in the #1 car, Lexus has several former Super GT champions in its line-up, including Hiroaki Ishiura, Yuji Tachikawa or Heikki Kovalainen. Other names, such are Kazuki Nakajima, Kamui Kobayashi or Yuji Kunimoto, are guaranteeing that Lexus is again the main pretenders for the title. The former F1 driver Kamui Kobayashi is also Super GT rookie after he made a one-off appearance in last year’s Suzuka 1000. Last year’s GT500 vice-champions Tsugio Matsuda and Ronnie Quintarelli will again share the #23 Motul Autech Nissan GT-R. Nissan’s veteran Satoshi Motoyama will stay in the same car with Katsumasa Chiyo but they moved from Mola to NDDP Racing with B-Max. One more veteran Joao Paulo de Oliveira will share a Nissan with reigning Japanese F3 champion Mitsunori Takaboshi. In Honda’s line-up, Jenson Button came to the Team Kunimitsu so Takuya Izawa moved from Kunimitsu to ARTA (Autobacs Racing Team Aguri) to share a car with Tomoki Nojiri. The fastest Honda during official tests was the #17 car of Koudai Tsukakoshi and Takashi Kogure.